Chana Chaat Recipe is a light and refreshing Indian salad that’s perfect for summers. This chana chaat recipe is very easy and can be easily adapted with different ingredients. Learn how to make chana chaat recipe with my easy recipe! So, it’s crazy hot and no one really wants to cook, amiright? But we can’t exactly go hungry, can we? Worry not, I have the perfect solution to all your summer blues about standing in the kitchen and cooking!! This chana chaat recipe is perfectly delicious (and healthy!!! ), involves no cooking and is literally ready in 15 minutes. Also, you can add in ingredients or take them out, and just basically do whatever you feel like, because this chana chaat recipe is foolproof and super delicious no matter how you make it! So What Exactly is Chana Chaat? Chana Chaat is an Indian Chickpea salad usually made with lemon juice, chopped vegetables such as tomatoes and onions, green chilis, and chaat masala (which is an Indian spice mix). Some people also add chunks of boiled potatoes and tamarind chutney (imli). In some households chana chaat is cooked a little bit, but in some households its served cold and not cooked. I like to change up my chana chaat recipe depending on my mood and the ingredients I have on my hand. The chana chaat recipe I’m sharing with you today is the easiest and simplest, yet the most delicious in my humble opinion. I even skip the chaat masala in this recipe because not everyone has it in their pantry. How to Make Chana Chaat? So for the chana chaat recipe, you only need a few simple ingredients and then its just a matter of tossing them together. Chickpeas (garbanzo beans) – usually people boil the chickpeas first, but I find it easier and equally delicious to use canned chickpeas. It’s equally delicious and convenient to use the shortcut. Finely chopped tomatoes, onions (I use red onions but you may use white onions as well) and finely chopped green chilli. A handful of chopped coriander – YUM! Chaat masala – I sometimes use this, sometimes I don’t, depending on my mood. I have not included this in the recipe today because I know not everyone has this Indian spice mix in their pantry. However, if you want to use it, half a teaspoon goes a long way. Chaat masala is available at Indian stores and in the ethnic aisle in most big grocery stores. 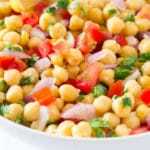 This chana chaat recipe (Indian Chickpea Salad) is a no cook salad and is super delicious. Chana chaat recipe requires only a handful of simple pantry ingredients, and is ready in no time. Perfect for a light lunch or potlucks! In a large bowl, add all ingredients and mix until well combined. Refrigerate for at least 30 minutes (up to overnight). When ready to serve, toss the chana chaat once more and top with more chopped coriander if desired. How refreshing. It is my favourite for a long time. This also great for a picnic. Imagine sitting in under a shade of a huge tree, cool breeze tempering the heat and lush green grass in the park and rolled hay on the hills in the distance. Remember Bath in Somerset ! You open your cool box and out comes chana chat and you put it on paper plates and take your little pocket knife and cut a lemon then squeeze in fresh lemon juice-aaah the fragrance and coolness of this dish is heavenly. I would suggest accompaniment-sparkling spring water -preferably from the hills of somerset . I’ve never tried chana chaat before but it looks absolutely delicious! Must try the recipe! This salad looks so light and healthy! I don’t think I’ve ever had this spice mix before, but I’ll be looking for it because I’ll bet it’s delicious. This looks delicious! I think I actually had something similar to this recently, but I didn’t know what it was called. I’m all for making it at home though and I will definitely be trying this. It looks so lovely, fresh and full of flavour! Oh how lovely! I.make chana chat quit often it’s such a great recipe and love by everyone whether you serve it in a Get-together , potluck , picnic .. you name it!